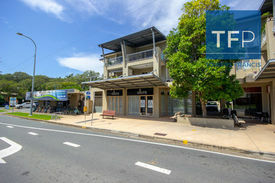 34 Commercial Real Estate & Properties in Currumbin Waters are listed in 4 categories. We have 28 Industrial Warehouses Sale & Lease , 3 Retail ShopsSale & Lease , 2 OfficesSale & Lease and 1 Other Commercial PropertiesSale & Lease . Lease one or lease both of these two ground floor retail shops currently fitted for a food retail. Plug in and go in this tightly held holiday mecca in what is Gold Coast best kept secret location Currumbin. FEATURES Total shop area of 133sqm 2 basement car parking spaces. Exclusive use weather protected alfresco. This offering has serious potential for an experience food retailer or restaurateur. Opposite Currumbin Creek and reserve, with a pleasant funky vibe. Comes with extensive food retail fit out ready to walk into and start trading immediately. Fully approved, reticulated to the grease trap you wont find this anywhere else!~ PRICE: FOR LEASE: $6420 PCM + Outgoings + GST or lease separately for $2800PCM & $3620PCM. For more information or to arrange inspection, contact exclusive marketing agents. Storage Or Boutique Warehouse With Nice Outlook Only $250 + GST per week! 60m2 of clean open space large roller door entry wide windows facing North to catch a breeze access to renovated, shared facilities plenty of onsite parking easy access at all times Seamless solution at only $250 + GST Per week incl all outgoings & power! Starters Package On Ground Floor Only $180 + GST per week! clean 30m2 approx storage or mini factory secure in gated complex access to renovated shared facilities vehicle size roller door access plenty of visitor loading car spaces onsite Great value starters package at only $180 + GST per week. 60m2 total floor area Own facilities incl. kitchenette Epoxy floor Roller door access Secure complex Private balcony For LEASE: $1,250 + GST PCM Disclaimer PRO Commercial has not personally confirmed the property information we pass on. We give no guarantee as to the accuracy of this information. Prospective purchasers and lessees should rely on their own enquiries and should satisfy themselves as to the truth or accuracy of all information given by their own inspections, searches, advices or as is otherwise necessary. No duty of care is assumed by PRO Commercial toward the purchasers and lessees with regard to the use of this information and all information given is given without responsibility. 124m2 total floor area comprises of 104m2 warehouse space plus 20m2 storage mezzanine roller door access own facilities incl. kitchenette For LEASE: $1,450 + water + GST PCM Disclaimer PRO Commercial has not personally confirmed the property information we pass on. We give no guarantee as to the accuracy of this information. Prospective purchasers and lessees should rely on their own enquiries and should satisfy themselves as to the truth or accuracy of all information given by their own inspections, searches, advices or as is otherwise necessary. No duty of care is assumed by PRO Commercial toward the purchasers and lessees with regard to the use of this information and all information given is given without responsibility. 40m2 loft / work space over two levels Edgy epoxy floor Roller door Kitchen and full bathroom incl. shower Own balcony Modern, as new building Central Currumbin position near Aust. Post, cafés, fast food, tavern, etc. For LEASE: $240 PW + GST (was $300 PW + GST) Disclaimer PRO Commercial has not personally confirmed the property information we pass on. We give no guarantee as to the accuracy of this information. Prospective purchasers and lessees should rely on their own enquiries and should satisfy themselves as to the truth or accuracy of all information given by their own inspections, searches, advices or as is otherwise necessary. No duty of care is assumed by PRO Commercial toward the purchasers and lessees with regard to the use of this information and all information given is given without responsibility. 28m2 total floor area Glass entry door Allocated car park Own facilities incl. kitchenette Roller door access Epoxy floor Great location Close to the M1, post office, cafes', pub etc. 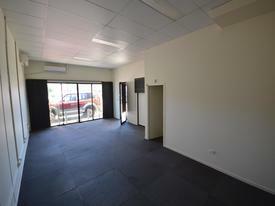 For LEASE: $225 + GST PW Disclaimer PRO Commercial has not personally confirmed the property information we pass on. We give no guarantee as to the accuracy of this information. Prospective purchasers and lessees should rely on their own enquiries and should satisfy themselves as to the truth or accuracy of all information given by their own inspections, searches, advices or as is otherwise necessary. No duty of care is assumed by PRO Commercial toward the purchasers and lessees with regard to the use of this information and all information given. 134m2 total floor area Own facilities Roller door access Glass entry door Great natural light Perfect position: close to M1, cafes', post office, pub, beach etc. Clean complex Allocated car park Plenty of street parking For LEASE: $2,250 + GST PCM Disclaimer PRO Commercial has not personally confirmed the property information we pass on. We give no guarantee as to the accuracy of this information. Prospective purchasers and lessees should rely on their own enquiries and should satisfy themselves as to the truth or accuracy of all information given by their own inspections, searches, advices or as is otherwise necessary. No duty of care is assumed by PRO Commercial toward the purchasers and lessees with regard to the use of this information and all information given is given without responsibility. 60m2 total floor area Direct roller door access Own facilities incl. shower Kitchenette Glass door entry with steel security bars Allocated car park Street parking Great location: post office, cafes', pub Quick M1 access For LEASE: only $1,400 + GST PCM Disclaimer PRO Commercial has not personally confirmed the property information we pass on. We give no guarantee as to the accuracy of this information. Prospective purchasers and lessees should rely on their own enquiries and should satisfy themselves as to the truth or accuracy of all information given by their own inspections, searches, advices or as is otherwise necessary. No duty of care is assumed by PRO Commercial toward the purchasers and lessees with regard to the use of this information and all information given. Centrally Located Warehouse- Perfect For A Start Up Business Reduced to $250 + GST Per..
40m2 total floor area High bay roller door Street front unit Easy access Glass entry door Epoxy floor Own facilities incl. kitchenette Allocated car park Street parking Prime position: close to the M1, post office, cafes', beach, pub etc. For LEASE: reduced to just $250 + GST Per Week Disclaimer PRO Commercial has not personally confirmed the property information we pass on. We give no guarantee as to the accuracy of this information. Prospective purchasers and lessees should rely on their own enquiries and should satisfy themselves as to the truth or accuracy of all information given by their own inspections, searches, advices or as is otherwise necessary. No duty of care is assumed by PRO Commercial toward the purchasers and lessees with regard to the use of this information and all information given is given without responsibility. Pristine Currumbin Waters Office Space With Ground Floor Warehouse & Reception $2,600 + GST + outgoings ..
328m2 total floor area Comprises of 170m2 clean warehouse space, incl. a ground floor reception area Plus 150m2 first floor quality office fit out Large, open boardroom & lounge space Storage rooms Two kitchenettes Own facilities 2 roller doors Glass door entrance Glazed office Horse shoe driveway Allocated car spaces Great location Close to the M1, Gold Coast International Airport, Cafes', Post Office & Pub For LEASE: $2,600 + GST + outgoings PCM Disclaimer PRO Commercial has not personally confirmed the property information we pass on. We give no guarantee as to the accuracy of this information. Prospective purchasers and lessees should rely on their own enquiries and should satisfy themselves as to the truth or accuracy of all information given by their own inspections, searches, advices or as is otherwise necessary. No duty of care is assumed by PRO Commercial toward the purchasers and lessees with regard to the use of this information and all information given is given without responsibility. Large Open Plan Warehouse In Currumbin $1,850 + % outgoings + GS..
153m2 total floor area High bay roller door Rear roller door to breezeway Own facilities For LEASE: $1,850 + % outgoings + GST PCM Disclaimer PRO Commercial has not personally confirmed the property information we pass on. We give no guarantee as to the accuracy of this information. Prospective purchasers and lessees should rely on their own enquiries and should satisfy themselves as to the truth or accuracy of all information given by their own inspections, searches, advices or as is otherwise necessary. No duty of care is assumed by PRO Commercial toward the purchasers and lessees with regard to the use of this information and all information given is given without responsibility. 50m2 total area Comprises of 30m2 ground floor area 20m2 office/mezzanine space Plus balcony Fresh epoxy floor Glass entry door Roller door access Air conditioning Access to shared bathroom and kitchen facilities Secure gated complex Easy access Close M1 access (North & South) Perfect for a start up business For LEASE: $300 + GST PW Contact 0402 129 455 or br@procommercial.com.au for inspections Disclaimer PRO Commercial has not personally confirmed the property information we pass on. We give no guarantee as to the accuracy of this information. Prospective purchasers and lessees should rely on their own enquiries and should satisfy themselves as to the truth or accuracy of all information given by their own inspections, searches, advices or as is otherwise necessary. No duty of care is assumed by PRO Commercial toward the purchasers and lessees with regard to the use of this information and all information given is given without responsibility. 18m2 total area Glass entry door Great natural light and breeze Secure gated complex Access to shared bathroom and kitchen facilities Allocated car space First to occupy Perfect for small businesses For LEASE: only $150 + GST PW Disclaimer PRO Commercial has not personally confirmed the property information we pass on. We give no guarantee as to the accuracy of this information. Prospective purchasers and lessees should rely on their own enquiries and should satisfy themselves as to the truth or accuracy of all information given by their own inspections, searches, advices or as is otherwise necessary. No duty of care is assumed by PRO Commercial toward the purchasers and lessees with regard to the use of this information and all information given is given without responsibility. 354m2 warehouse/showroom Includes 2 offices and reception space 2 high access roller doors Internal amentites male/female Road front exposure Great signage opportunities Glass frontage For LEASE: $4,400 + GST PCM net Disclaimer PRO Commercial has not personally confirmed the property information we pass on. We give no guarantee as to the accuracy of this information. Prospective purchasers and lessees should rely on their own enquiries and should satisfy themselves as to the truth or accuracy of all information given by their own inspections, searches, advices or as is otherwise necessary. No duty of care is assumed by PRO Commercial toward the purchasers and lessees with regard to the use of this information and all information given is given without responsibility. Spacious Warehouse And Air-conditioned Office Space Located In Currumbin $1,800 + water consumptio..
215m2 total comprises of 165m2 ground floor incl. 15m2 office space 50m2 mezzanine incl. 15m2 office space own facilities allocated car parks air conditioning high roller door access positioned close to the M1 For LEASE: $1,800 + water consumption + GST PCM Disclaimer PRO Commercial has not personally confirmed the property information we pass on. We give no guarantee as to the accuracy of this information. Prospective purchasers and lessees should rely on their own enquiries and should satisfy themselves as to the truth or accuracy of all information given by their own inspections, searches, advices or as is otherwise necessary. No duty of care is assumed by PRO Commercial toward the purchasers and lessees with regard to the use of this information and all information given is given without responsibility. 112m2 ground floor area Own facilities inc. bathroom and kitchenette 3 phase power Entire building freshly renovated inc. interior and exterior paint and new insulated roof Bright, open factory floor Great security Positioned close to M1 access North and South For LEASE: $1,500 + GST PCM Positioned in the popular Currumbin Industrial and Commercial hub with all services available in the surrounding area. Minutes to Gold Coast International Airport and pristine beaches and the tenant lifestyle. Disclaimer PRO Commercial has not personally confirmed the property information we pass on. We give no guarantee as to the accuracy of this information. Prospective purchasers and lessees should rely on their own enquiries and should satisfy themselves as to the truth or accuracy of all information given by their own inspections, searches, advices or as is otherwise necessary. No duty of care is assumed by PRO Commercial toward the purchasers and lessees with regard to the use of this information and all information given is given without responsibility.